The 1920s neo-Georgian facade of this building disguises its industrial origins as Irvine & Stevenson’s nineteenth-century factory complex. 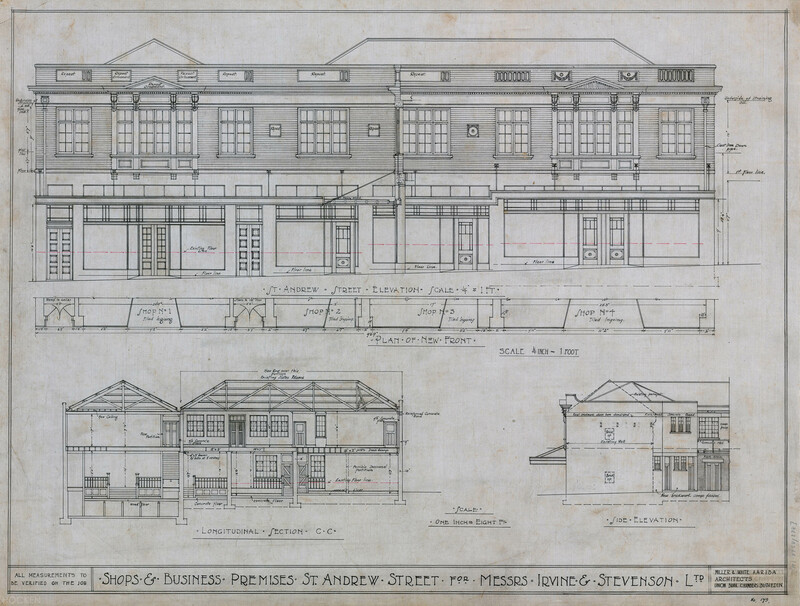 In my last post I looked at the company’s shop and office buildings next door, on the corner of George and St Andrew streets, which were designed by J.A. Burnside and built in 1882. 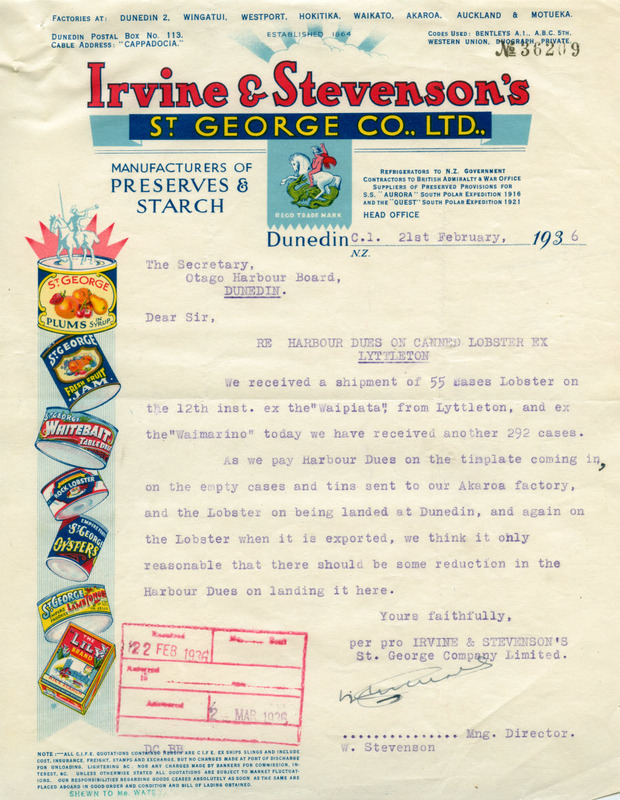 Irvine & Stevenson were one of New Zealand’s leading producers of preserved meats, jams, soups, starch, and other (mostly food) products. By 1919 the company had nine subsidiary factories in other parts of New Zealand and it remained a large player in the food industry until it wound up in 1977. To begin with, old buildings on the site were used for factory activities. They were replaced in stages, beginning with a two-storeyed bacon factory/curing house designed by Burnside in 1882 and completed in 1883. Later development can be pieced together (though not with complete confidence or clarity) from a surviving company ledger. Between the curing house and the shops were a double cottage and brick stables, which were fitted with gas in 1884. In 1886 ‘sheds’ were demolished and replaced with a smoke house for sausages. The cottages were then replaced with a new jam factory building, built between January and June 1888. This was likely designed by R.A. Lawson, as the ledger shows that fees of £33 10s 6d were paid to him in connection with the project in June 1888. The contract price was recorded as £634. In 1891 Irvine & Stevenson acquired the local operations of the Australian jam company Peacock & Sons., and all jam production moved to their factory in Moray Place, which became known as the ‘no.2 factory’. 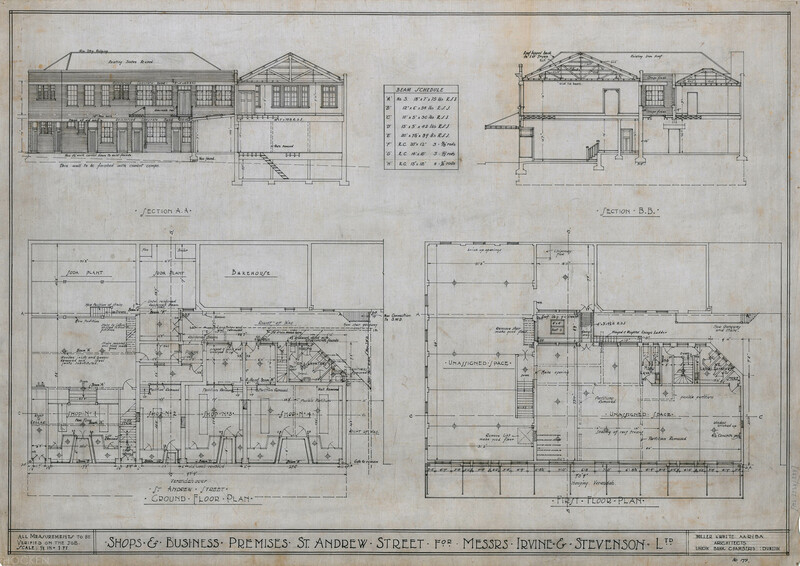 In 1894 the St Andrew Street factory was described as having 100 x 66 feet of floor space on each of its two storeys. Activities on the site at that time included bacon curing, sausage making, tea blending, coffee and pepper grinding, and washing powder manufacturing. 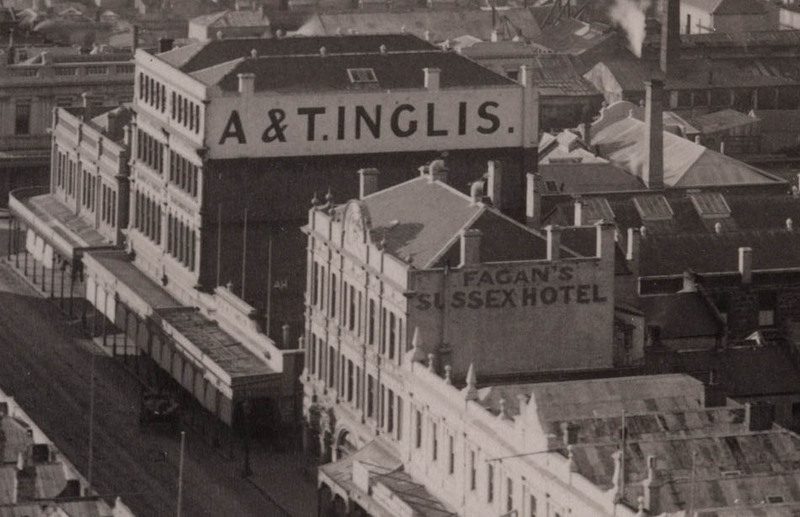 The company purchased Keast & McCarthy’s large brewery in Filleul Street in 1896 and afterwards consolidated most of its Dunedin manufacturing on that site. The buildings (in the box at left) as they appeared c.1895. W.R. Frost photograph. A late 1880s view, showing Irvine & Stevenson’s buildings behind the A. & T. Inglis store. They include the tall chimney stack and the building immediately to its right. Ref: Te Papa O.002091. Messrs Irvine and Stevenson have on their premises power refrigerating machinery, which is used partially for the curing of bacon, and also for providing cold storage for the city. A glance into the chambers reveals that the contents are surprisingly miscellaneous. Lake Wakatipu trout, caught months previously, and fish of many other varieties, wild ducks, hares, pork, mutton, veal, large numbers of the omnipresent rabbit – these are awaiting shipment to some distant part; and in separate chambers are stored large quantities of butter belonging to various local factories. The freehold of the St Andrew Street property was purchased in 1916 and in the 1920s soda crystals (for laundering) were still being produced there. The buildings eventually became surplus to requirements for production purposes but they were kept as an investment property for the I&S Trust, the property arm of Irvine & Stevenson which operated as a separate company for some decades. In 1929 the refrigeration plant was removed and the old buildings were rebuilt with structural strengthening (steel and concrete), a new brick facade, new shops and shop fronts, and altered roof lines. A curious dogleg vehicle access and yard remained, and old slates were also reused. The style chosen for the facade was freely interpreted Georgian Revival and the architect was Eric Miller (1896-1948) of Miller & White. 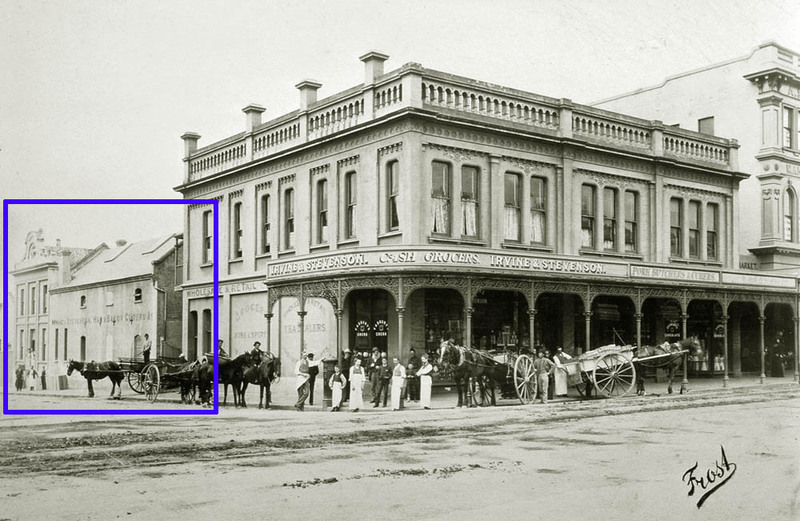 The building is similar in style to another Miller & White design, built for W. Duke & Sons, at the corner of King Edward Street and Hillside Road in South Dunedin. A larger brick-faced building Miller designed was the South Block (now Hercus Building) of the Otago Medical School, completed in 1948. Miller & White drawing for the 1929 work (elevations and sections), Hocken Collections MS-2758/0378. Miller & White drawing for the 1929 work (sections and floor plans), Hocken Collections MS-2758/0378. 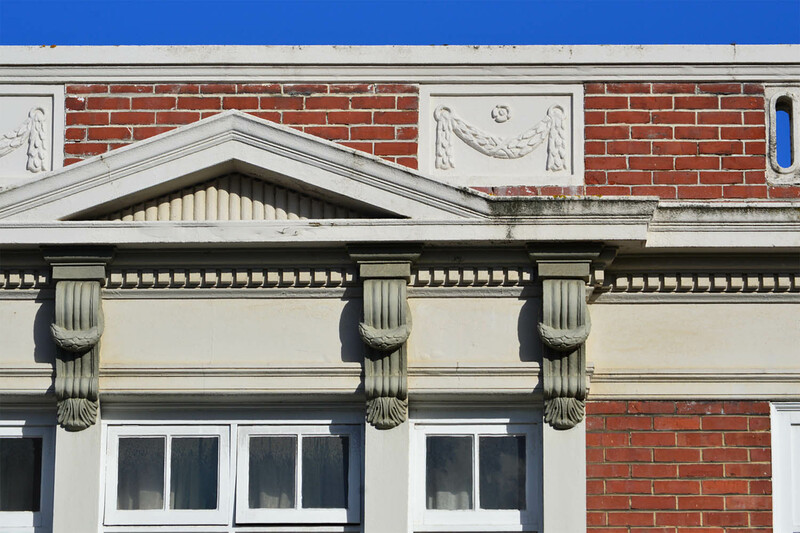 A building with a rather striking and dignified appearance is that just constructed by Messrs Ellis and Glue in St Andrew Street. The structure referred to is situated on the site used at one time as a bacon curing factory by Messrs Irvine and Stevenson. Now this firm has converted the building into four modern shops on the ground floor with two spacious rooms upstairs which are now being utilised by Mr J.W. Finch, of the Octagon Billiard Parlours, as an up-to-date billiard parlour. The extensive alterations were constructed about six months ago by the contractor, who first of all was called upon to shift about 1,000 bags of pumice and a large quantity of charcoal. The finished building shows a new brick front, with the curtains on the windows of the top floor giving it a homely appearance. The shops below are fairly large, and are given quite an impressive finish with terrazzo around the basements and piers of the windows. The doors and other woodwork are in oak, while the ceilings and walls are tastefully designed in fibrous plaster. The billiard parlour, which has been leased for a period of ten years, is divided into two rooms, with five tables in each, and it is intended to make further provision for another table. Messrs Miller & White were the designers of the building, which cost something in the vicinity of £5,000. A 1936 letterhead for Irvine & Stevenson. By this date the company had stopped using the St Andrew Street buildings for manufacturing. Hocken Collections AG-200-11/04/1319. The Dunedin Cue Club in 2014. 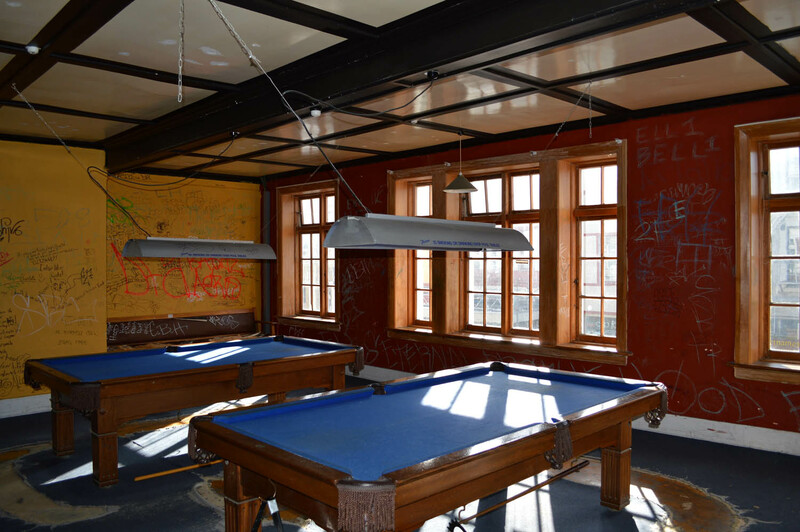 A billiard parlour or pool hall has been operating continuously from the upper floor since 1929. For many years named the Grand Billiard Parlour, it later became the Grand Billiard Rooms, and then the Grand Snooker Centre. 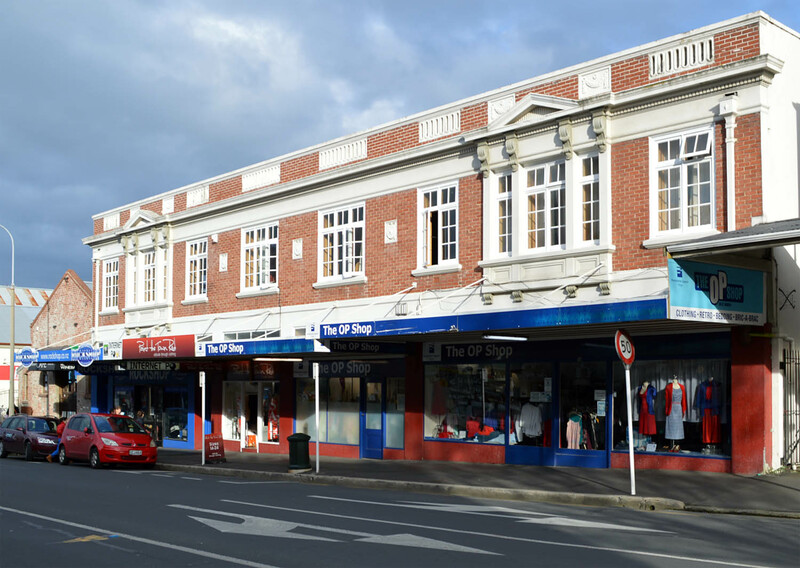 In 1998 it became the Dunedin Cue Club and it currently also offers internet and gaming facilities. Director Mark Peisker kindly showed me around and said that one of the tables is thought to have been there since the hall opened 85 years ago. Downstairs, a cycle shop was the first occupant of the shop at no. 59. Originally Ernest Packer Stevenson’s Cycle Works, it became Knight’s Cycle Works in 1951 and later diversified into prams and children’s nursery goods. In 1969 the business moved to the shop at no. 67 as Knight’s Nursery Centre and it closed around 1991. Other tenants have included the Laurier Floral Studio (at no. 61 from 1938 to 1970), and the T.W.T. Engineering Co. (at no. 67 from 1939 to 1959). The Presbyterian Social Services Association (now Presbyterian Support Otago) Opportunity Shop opened at no. 59 in 1972. It later expanded into the shop next door and is still there today. The other retail businesses currently in the building are Paint the Town Red (boutique fashion clothing) and Rockshop (musical instruments and audio). The I&S Trust relinquished its last interests in the property in the early 1960s and for many years it was owned by the Butler Family. It may be considered part of the Larent Buildings that front George Street (but do not include the corner site which is on a separate title). The unspoilt St Andrew Street facade demonstrates how a relatively modest building can have a distinctive street appearance while still being in scale with and sympathetic to its surroundings. The square-paned windows with their timber frames are a particular delight, and I seldom walk past this building without appreciating it. 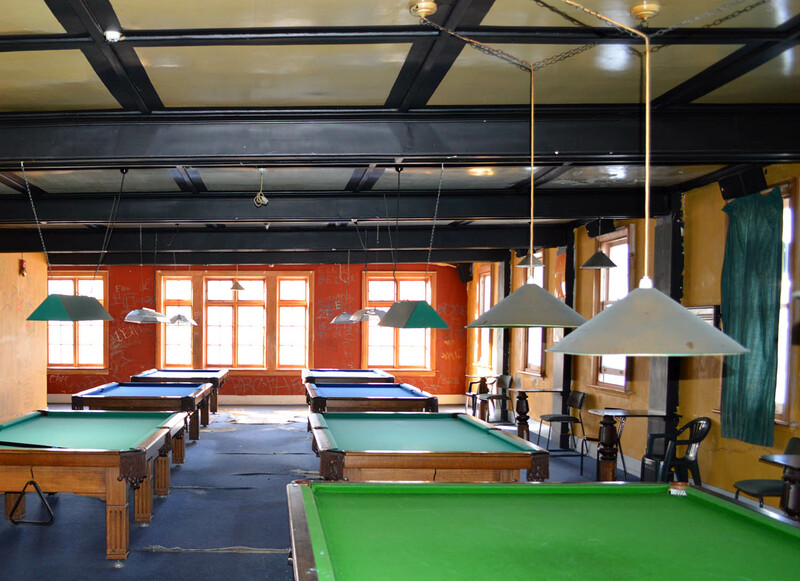 You might also spare a thought for Dunedin’s rich industrial past and eight decades of billiards as you wander by! This entry was posted in Buildings and tagged 1880s, 1920s, Ellis & Glue, Eric Miller, Industrial buildings, Irvine & Stevenson, J.A. Burnside, Miller & White, Neo-Georgian, R.A. Lawson, St Andrew Street on 27 July 2014 by David Murray.